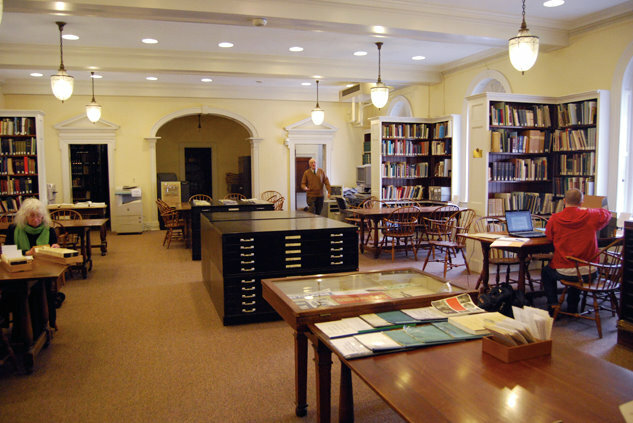 The Whitney Library of the New Haven Museum is a unique resource center concerning the history of New Haven and its families from the time of the New Haven Colony in the 17th century to the present. Founded in 1862, the Library provides the materials and assistance required by the scholar and the student of the history and genealogy of New Haven. Collections include 30,000 printed works, 300 manuscript collections, architectural drawings, maps, broadsides, newspapers, scrapbooks, photographs, and microfilm. The Whitney Library services over 1,300 researchers each year, including college students, professors, genealogists, local historians, and many others who are interested in their houses, families, businesses, and towns. The following pages provide additional information about the resources and research opportunities available at the Whitney Library. If you are interested in rights and reproductions information with regard to research for publications, film and other media please see the Rights and Reproduction Information. To contact the Library, call (203) 562-4183 x115 or email library@newhavenmuseum.org.